Dragon Armor Pro Kit No. 7339 - Sd.Kfz. 171 Panther Ausf G w/ Steel Road Wheels. Home > Reviews > Small Scale > Dragon Armor Pro No. 7376 Tiger I (Initial Production). Stock Number and Description Dragon Armor Pro No. 7376 Tiger I (Initial Production). 137 light grey plastic parts on 4 sprues plus 1 Part, 11 PE parts on one fret, 2 DS100 lengths of track and 1 metallic cable wire, An A5 sized, 3 page folded instruction sheet with parts plan, 8 build diagrams and one page of paint/decal instructions. Advantages: Well moulded, highly accurate and detailed, all hatches can be modeled open, 2 interesting schemes on a well printed decal sheet. Over the last twelve to eighteen months, Dragon has taken over the mantle of ‘Top Dog’ in 1/72 scale armour. They’re not perfect mind you, some say their pricing is too high and their instructions could do with some help occasionally and some of their early kits, still on sale today, were woeful. But they got better and it happened so quickly that it seemed like a new manufacturer had come on to the market. 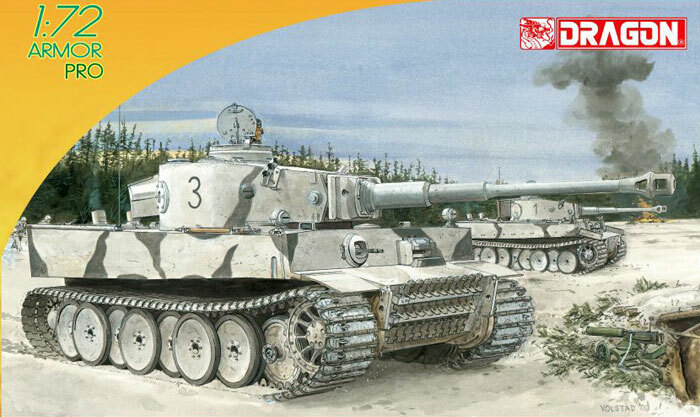 Now they’ve just come out with two Tiger I kits that are astounding. So good that they are with out a doubt the best in the scale with a level of detail and accuracy never seen before. However, they are not Dragons first Tiger Is and like the Royal Navy’s Dreadnought, they’ve made all of Dragons earlier Tiger I kits redundant. They’ve already given us the late production, mid production, mid with Zimmerit and a hybrid Tiger but they are all based on the same set of very early moulds way back when Dragon first got into this scale wit h armour. These kits are termed Initial Production Tigers, kit Nos. 7370 and 7376, and they are the first of the Early Production kits. The two kits are almost identical with the main difference being the turret bins carried by the various vehicles. The first kit, 7370, has one or two bins, on the sides of the turret as apposed to on the rear and only one decal option, a vehicle seen in Leningrad in 1942. 7376, on the other hand, has a smaller Panzer III based bin on the rear of the turret, two decal options, one with lots of winter camouflage like 7370 and another in overall Panzer Grey, Leningrad area 1942/43. 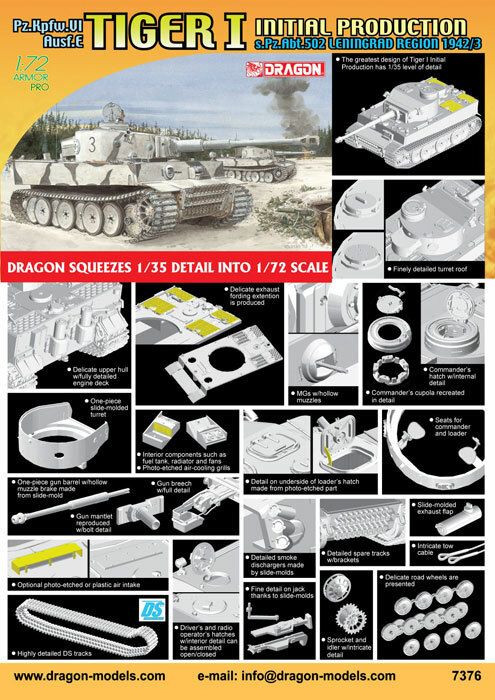 These two Initial Production Tiger kits have much more detail than earlier Tigers from Dragon. For a start, they are the only ones in the scale with the correct asymmetric turret. All of the hatches, both in the turret and the hull, can be modelled in the open position and have underside detailed. There is full radiator detail under the engine deck which I find kind of curious as little of it will be visible once the deck is fitted and PE mesh screens fitted over that. Then there is the turret interior. Not a full interior but much more than usual with full main gun breech detail plus Loader's and Commander's seating. Only time will tell. Watch this space.